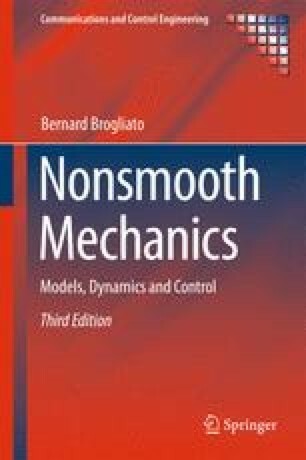 This chapter introduces the variational principles of mechanics in the case of unilateral constraints and impacts. We start with virtual displacements and then proceed with variational inequalities formalisms (equivalently inclusions into normal cones to tangent cones and convex sets), Fourier and Jourdain’s principles. The second part is dedicated to the Lagrange dynamics. The case with exogenous impulsive forces is obtained from the material of Chap. 1. Hamilton’s principle, which is far more involved, is treated in the last part of the chapter. The chapter ends with some comments about the link with optimal control under state inequality constraints.